Finding PADI Instructor Jobs in Australia can be relatively easy if you have the right tools to help you. At Abyss, we teach lot of different PADI Instructor programs, probably more than any other facility in Australia. All of our PADI Instructor level internships include job placement assistance which makes finding a PADI Instructor Job in Australia so much easier than doing it on your own. Personally, my name is Carl Fallon and I am a Platinum PADI Course Director and Careers Development Manager here at Abyss Scuba Diving. I also have a long background in the graphic design industry and personally design and customise each candidates resume (CV) to make our candidates stand out. Because of the number applicants for each job these days, you have to stand out to be noticed. First impressions don’t start just with the first phone call or interview, but with them opening your initial email with your application. So it is very important that you appear professional from the get go. Follow some of these basic guidelines and you increase the opportunity of gaining the position you apply for. Professionalism starts from your very first email contact or phone call. You must prepare yourself with information about the employer prior to any contact. You can do this by researching their website to see what they are all about and customise each contact. Add in your personal information and contact details to make it easy for them to get back to you. This is what I have. It is easy to read and looks professional. This is very easy to create. Each email contact you have with the dive centre you should be asking questions to solicit a response. This will make you appear more interested than other Instructors, and keener to get involved with that particular facility. 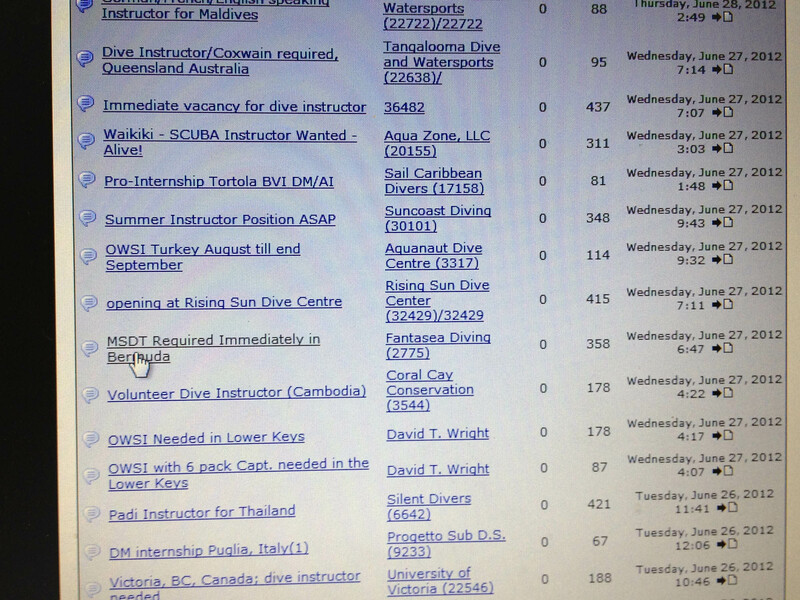 I get emails about employment all the time that have over 20 or 30 different dive centre’s CC’s in on the email. Guess what I do when I get these emails? I delete the email and don’t even waste my time to read it. Obviously if the Instructor applying is just shopping around and doesn’t care about where they end up, I don’t care either. If an Instructor can’t be bothered to send a personal email to my facility, it reflects directly on their work ethic. If they put the effort in and go out of their way to ensure they customise the email to us, I would read it and respond immediately. Common sense really. Sometimes emails with attachments go directly to the spam box of the recipient. So another option is to upload your resume to a website like yousendit.com which will allow you to send a quick download link to your resume. It will not be bounced and you can be certain that they always get there. Each application should include a cover letter (Which in the case of an email is just the content of the email you attach or copy the resume to). So don’t just write “Hey, check out my resume.” Describe yourself in a short concise paragraph and include some specific piece of information about the dive centre you are sending it to. Like,” I have checked out your dive site page and I can’t wait to go diving at the Abyss site. It sounds fantastic!” Something short like this, make you sound interested and keen to go there. I expect all my Instructors to treat Job searching professionally and that is why so many of our Instructors have jobs almost immediately after their graduation. Ensure that you make your CV stand out. A word document is what is expected if you are doing an office job, and wearing a suit. We are in the adventure industry and you need to sell yourself as a fun, outdoors, sporty, and exciting person that will get along well with anyone. If you think a word document does this, then great. Personally, I want to see photos of not only the Instructor, but also them doing activities they love doing. Surfing, hiking, having fun! etc… So spice up your resume and make yourself stand out. Whether you like it or not, every employer will look at your facebook page. All they need is your email that is linked to your facebook and they will throw it into facebook search and pop up your profile. If your facebook is full of drunken images and childish antics, either use a different email that isn’t linked to your facebook, or delete all those photos. In the past I have made decisions on employees based on the ridiculous photos I have seen on their pages. Again, first impressions last, and if your page leaves a nasty taste in the mouth of your potential employer, you can only imagine what they would assume about you. The Professional login section of PADI.com is a fantastic resource that only PADI Professionals have access to. There is an employment board which is updated hourly and has jobs from all over the globe. Truly amazing. 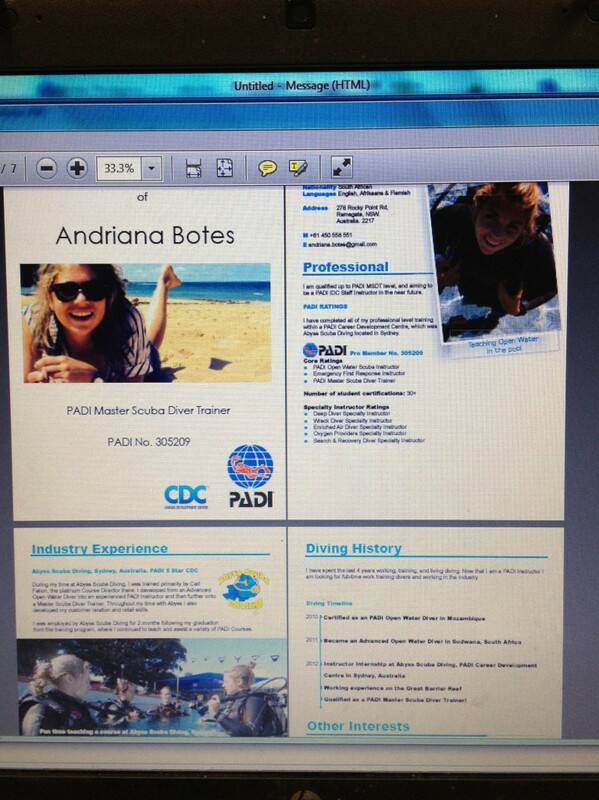 There is also a section where PADI Instructors looking for employment can post that themselves for employers to search. This should be done and include in the heading, where you are looking at working. Keeping in mind that employers will search their location and come up with all the instructors looking for work in that area. Make sure you include a link to download ur Resume because you can’t attach any items in there. Job availability does fluctuate throughout the year here. Coming into the colder period of the year (Which is the middle months) you can expect PADI Instructor jobs in Australia to be fewer. This is because the majority of dive centres reduce their staff loading over this period. Coming into the warmer period, which is from June onwards facilities are looking at preparing for the peak season and in turn job opportunities seem to be more prevalent. If you are looking at training to become a PADI Instructor then you should consider the seasonal changes in the industry to allow you to graduate at the start of the peak season. This would allow you to move more easily directly into a job in your ideal area. The higher up the PADI Instructor chain you go, the rarer you are and more precious you are to a facility. 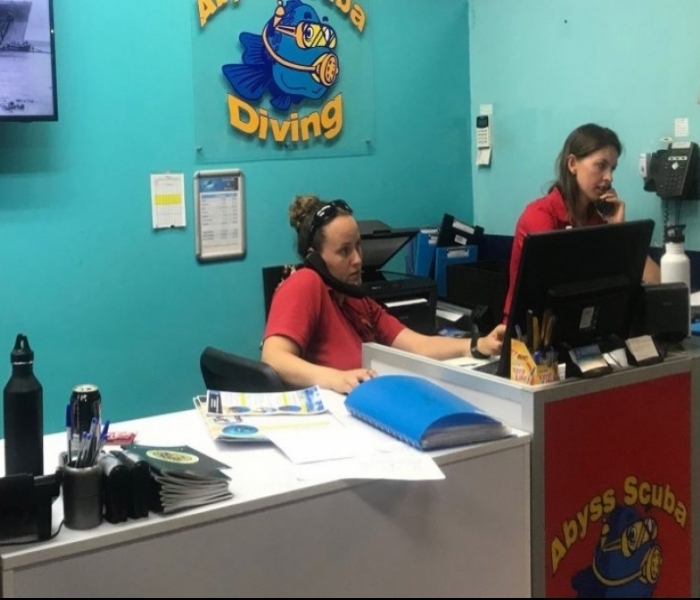 Training at Abyss Scuba Diving in a Instructor Internship will mean that you will graduate higher than a standard PADI Instructor and you will actually train all the way through to an experienced PADI Master Scuba Diver Trainer (MSDT). This is a PADI Open Water Scuba Instructor who can teach 5 different PADI Specialty Courses and also has taught and certified at least 25 divers. 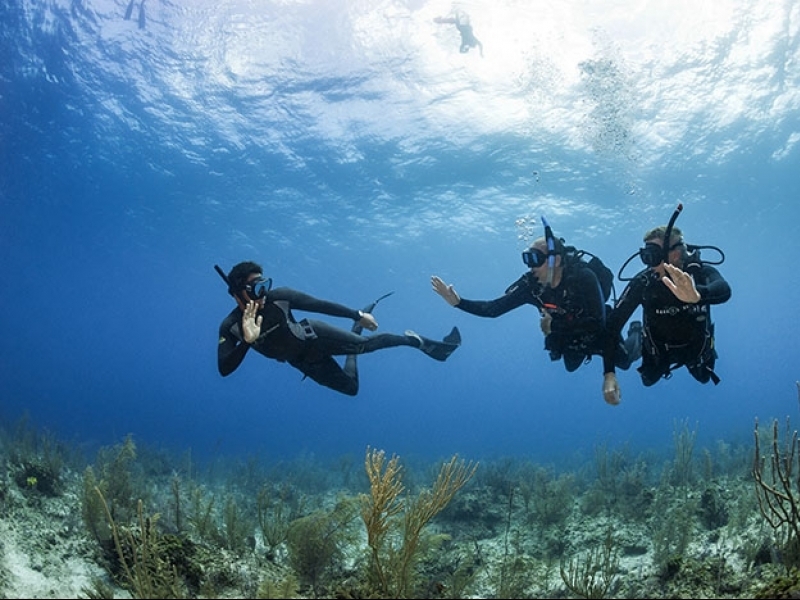 During the training here, we closely mentor each new Instructor with our team of PADI IDC Staff Instructors, Master Instructors and Course Directors to ensure you are continually learning every day. Being able to say you are a PADI MSDT on your application immediately puts you out in front of all the standard PADI Instructors out there applying for the same position. Becoming a PADI Staff Instructor is a privilege that even fewer PADI Instructors get to have. This is the next training program following the Master Scuba Diver Trainer qualification and will allow you to independently teach and certify PADI Assistant Instructors, and also help run parts of the Instructor Course. This rating should definitely be the goal of any serious PADI Instructor and will put you out in front of even the PADI MSDT’s. Very cool. This program is partially by invite only, but the majority of Abyss Instructor Internship candidates can have the opportunity to do this training at the end of their Instructor Program. This is dependent on their overall professionalism during their initial program. These are just a few quick tips, and just something to keep in mind. Just remember you are up against potentially hundreds of other Instructors looking to get the same job, so standing out is key. Do nothing as though you are amateur. Always be professional and perform Instructing professionally and the rest will just fall into place.